David G. Schwartz, the Director of the Center for Gaming Research and instructor at the University of Nevada, Las Vegas, studies gambling and casinos, Las Vegas, tourism, and games. He is also a Forbes contributor and a noted speaker. Schwartz has written several books, including Grandissimo: The First Emperor of Las Vegas, Roll the Bones: The History of Gambling, and Boardwalk Playground: The Making, Unmaking, & Remaking of Atlantic City. He has been extensively quoted in the media and featured in television programs. Born in Atlantic City, New Jersey, Schwartz earned his bachelor’s degree (a double major in anthropology and history) as well as his master’s degree from the University of Pennsylvania before receiving his doctorate in US History from UCLA. His academic interest in gambling stems from his hands-on experience in the casino industry as a security officer, surveillance officer, and Mr. Peanut. Reviewing The Toxic Meritocracy of Video Games presented a bit of a meta problem for me. Once I finished the introduction, a thought popped into my head and refused to leave. I had been asked to evaluate on its merits, including the skill of the author, a book that is about the toxicity of games that “valorize skill and technique” (back cover copy). One of the major points of the book is that meritocracy is a flawed concept. Identifying meritocracy as a system in which skill is measured and outcomes tracked, with a mixture of talent and hard work rewarded, the author states that “meritocracy isolates, individualizes, and strips out context” (13). And what is a book review, if not precisely that process? The reviewer is tasked with dissecting a work which is usually the product of years of labor, charting its strengths and, if catty, reveling in its weaknesses. It is difficult to imagine how to review a book, if not under some form of meritocratic system. 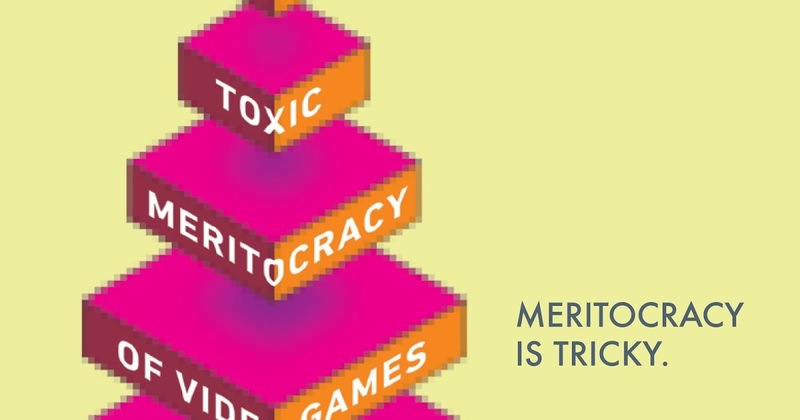 The problems with game culture undergird much of Paul’s consideration of meritocracy’s role in video games. Video games can open up entire new worlds of the imagination, placing the player into situations where they can explore new identities and novel situations. Online forums—the chief but not only place where game culture lives, as Paul and others see it—should be a place for people to come together to celebrate their shared passions. In many cases they can be, but too often they becomes an excuse for small-minded people to denigrate those who look, talk, act, or feel differently from them, aren’t as good at destroying imaginary enemies (or whatever), or are women. The anonymity of forums, combined with the echo chamber effect of many other users echoing a poster’s opinion, can create incredibly unwelcoming online spaces. Paul’s discussion of misogyny in game cultures catalogs some of the most disgusting outrages against women who simply wanted to make or write about video games. Paul argues that at least a portion of the misogyny that is apparently ubiquitous in game culture is due to meritocratic norms. For example, he cites the case of Geguri, amazingly successful Overwatch player who was accused of cheating, reportedly simply because she is a woman. Paul argues that “Geguri’s version” of Overwatch was harder than those of her opponents because of the barriers that she had to overcome (47). In other words, words, apparently equal access may not be quite so egalitarian. Paul explicitly links video games’ toxicity to their inherent meritocracy. They are, he argues, “a special different place perfectly designed and controlled to actualize an idealized form of meritocracy…. Video games are predicated on inequality, on the perception that some people are better than others and that when one is victorious it is precisely because of that player’s actions” (138). Meritocratic norms are reflected in the basic narrative of many games, where the player character starts off tentative, weak, and needing to master skills, and, by hard work, becomes powerful enough to meet an escalating series of challenges. Paul sees this progression as a mirror of the meritocratic structure of society, which rewards effort and achievement. Further, Paul sees video games’ celebration of skill as a thing that is inherently harmful. I am not in a place where I can say I agree; some games may be about out-scoring other players or defeating the end-of-level boss, but others (like Gone Home, which Paul writes about) are about exploring and experiencing. Paul notes that games like Gone Home are often derided by “serious” gamers as “walking simulators” since there is no “action” like shooting, killing, or puzzle-solving. The argument goes that if a game can’t beat a player, then the player can’t really beat the game. The loudly-expressed disapproval of a fraction of “serious” gamers, however, in no way diminishing the art or emotional impact of games tagged as “walking sims.” In accepting that “walking sims” are not evidence that games don’t have to be about killing and being killed, Paul seemingly surrenders a great deal of ground. Indeed, in his conclusion Paul discusses whole genres of games that resist meritocratic norms, but notes that these games are considered by “serious gamers” to be not as important as AAA titles, which usually involve levelling, improving, and achieving. But the fact that such games exist and are popular would seem to undercut Paul’s thesis that meritocratic norms are inherently part of game design and game culture. Gone Home has sold over 500,000 copies on Steam according to Steam Spy, has a Metacritic rating of 86, and nearly 13,000 “mostly positive” reviews on Steam. While Gone Home’s sales are dwarfed by those of a AAA title like Call of Duty: Modern Warfare 3, which has shifted about 31 million units, it’s still a real game that real people play. But for games that require good memories, sharp reflexes, and quick thinking, is the success of other players somehow harmful to those who are less able to aim and shoot, or figure out puzzles, or memorize unbeatable combos? People can be successful at anything for a variety of factors, but the reasons for success usually come down to some mixture of opportunity, natural talent, and drive. The first is, of course, bound by social and economic reality: even if I wanted to become a Street Fighter world champion, I had to work and attend school, which left little time for training to beat M. Bison. But even if I had the unlimited time and money needed to master the game, I’m frankly pretty uncoordinated and, as much as I like playing video games, not that good at them. What’s more, there are a whole lot of other things that I care more about than playing video games better than other people, which takes care of the third factor. The mere reality that some people are better than me at playing video games doesn’t take away from my enjoyment of them—this might be because I tend to enjoy the exploration/achievement areas of gaming than competition, but I can’t imagine that I’m alone in this. Further, what does it matter what “serious” gamers think? Frankly, gaming has too many gatekeepers as it is. The idea that one person, or a group of people, get to define what is and isn’t gaming, or good music, or anything is in most cases a bad one. Even if a majority of gamers prefer to fight, shoot, and conquer, there is still a lot more to video games than that. Paul ends the book with a heartfelt plea to start fixing a desperately broken system (180), showing that there is a real emotional immediacy to his consideration of meritocracy in video games: this isn’t just an academic exercise, but a way in which he feels that he can help games and game culture become more inclusive—a worthy goal. The question may be how to replace skill as the ultimate arbiter of accomplishment in (most) video games. Paul considers how luck can counterbalance skill, which is true, and he also describes how luck elements frustrate veteran skill players and that games which favor luck over skill tend to draw vehement detractors. It certainly can be disappointing to execute a strategy perfectly, yet run into a roadblock just because you failed a RNG check, but chance elements, even negative ones, can mirror the vicissitudes of real life. In other words, “random” events make the game more like real life. Still, if the point of video games is escape, I can understand why players wouldn’t want the bad luck that follows them around in real life to follow them into the game. To put it in a way that scholars can relate to: I like playing Civilization because I can actually accomplish things: once I research astronomy, for example, it stays researched, and I can build on it. Contrast this to any number of faculty meetings, where agreed-upon answers to faculty governance issues can be undone by second-guessing, worst-case-scenario-ing, and a general tendency to overcomplicate things. Part of video games’ appeal is that, unlike real life, players can control the narrative and even achieve perfection. So while there may be good reasons to place a greater emphasis on chance elements, it is not totally surprising that some players take exception to random setbacks. In other words, if the purpose of games is to transcend the less enjoyable parts of everyday life, a straightforward meritocratic structure might be better than being periodically hobbled by bad luck at random. As Paul stresses, real life is not meritocratic: a whole host of structural issues can prevent us from achieving our true potential were life a truly level playing field. Games can be a shelter from that terrible reality, which may be why “serious” gamers react so violently to real and perceived infringements on how games “should” be designed and played. Games might not be the opiate of the masses, but they can be a great way to blow off steam after a frustrating day or to simply feel a sense of accomplishment when life has been a series of frustrations and disappointments. Perhaps those who react so strongly to challenges to meritocracy in games are responding to the prospect that even this release will be denied them. As someone who studies gambling, I associate games of pure chance with those that have an unbeatable house advantage. Of course, in any single session a player can win, possibly a lot of money, playing a slot machine, but over their lifetime, they will inevitably lose. In this sense chance is an equalizer. But I must note that casinos and slot manufacturers are currently exploring how to develop “skill games” to appeal to younger players who, having been raised up in the meritocracy that Paul describes, aren’t happy pressing buttons and losing money. A truly skill-based game, though, would produce elite players who could eviscerate a casino’s bankroll, so the concept of skill-based casino games has created something of a dilemma for the industry. In my observations at least, the pure-chance nature of casino games doesn’t make them any more conducive to empathy or kindness than skill-based video games. In fact, with a tendency to internalize wins and externalize losses, players can actually take credit for “skill” in selecting the right machine, playing at the right time, etc, in prevailing at a game of pure chance. Highlighting luck may not be the solution. And then, it might be that I’m just so much a creature of the meritocratic, skill-valorizing system that I can’t see a way out of it. All in all, this is a carefully considered book that shines a much-needed light on the toxicity of video game culture and presents some earnest suggestions for how to reform it and the games that inspire it. One element that broke my immersion was the early intrusion of Donald Trump into the narrative, as an exemplar of meritocracy; I frankly don’t think this will age well, and doesn’t add much to the argument. Besides that, this book made me think very deeply about how we play and relate to each other, which is the best a book can aspire to. Going back to my original dilemma of how to evaluate a book that undercuts the justice of merit-based evaluations of skill, I briefly considered rolling a dice to randomize my “final” verdict, but felt that would be profoundly unfair to the author. So, going back to more traditional methods, I’ll say that, after reading it and considering it, this is a valuable book, and I look forward to reading more from the author.